First aid is basic knowledge about how to help people who are suddenly sick (illnesses) or hurt (injuries or body damage). For example, first aid is used at accidents to help an injured person until he receives medical treatment (help by doctors, nurses or ambulances). First aid is also used to help people who suddenly become sick, until help arrives or they can be taken to medical care. A person does not need much equipment to give first aid. A package of things useful to give first aid is called a first aid kit. Lives can be saved even without a first aid kit. First aid can be done just about anywhere that an emergency requires. In places far from hospitals, first aid may be the only help possible until the person can be taken to a hospital or clinic. Emergency medical dispatchers are trained in first aid, so that if there is an emergency, they can give the caller some information on what to do until the ambulance arrives. This can include the "C-A-B" listed below. 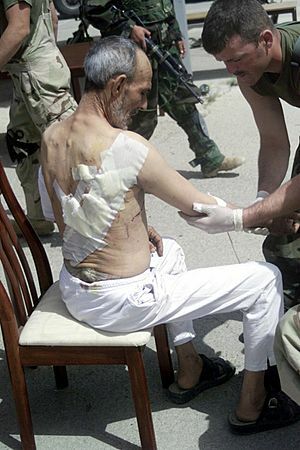 A US Navy corpsman gives first aid to an injured Iraqi citizen. First aid skills are kept simple on purpose so that people can remember and use them in an emergency to save at least one life. Prevent further injury – stop the person from being injured even more. If possible, an injured person should not be moved. First aid can include how to safely move injured people -- or move them anyway with less harm if there is no choice. Circulation (or Compressions) - keep blood inside the body and the heart beating. Compressions refers to a part of CPR called Hands Only CPR, where someone pushes with their hands on the center of a person's chest over and over again to keep blood flowing to the brain. This requires no kit and only a little training. Emergency medical dispatchers can tell a person how by telephone or radio. Keeping blood inside the body can be done using a piece of cloth (which soaks up blood) to apply firm pressure to the bleeding area(s). This "direct pressure" is the simplest and most effective way to stop bleeding. 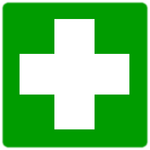 Others such as a tourniquet are taught in first aid classes. If a first aid kit is not there, a cloth "dressing" for direct pressure can be made from ripped or cut clothing. Airway - keep a path open for air to go from the mouth to the lungs. Turning an ill person on their side if they have vomited ("thrown up") may help keep the airway open so they can breathe. Moving a hurt person can make their injuries worse. But without an airway, a person cannot breathe and will soon die unless an airway can be re-opened. A choking person with no airway can be helped with abdominal thrusts, sometimes called the Heimlich maneuver. Breathing - move air from the outside into the lungs. "Giving breaths" is blowing air into someone else's mouth while holding their nose shut and watching their chest rise from the air you blow in. This is taught as part of CPR. A helper could get sick from "giving breaths" to someone who has a disease. A CPR class can teach how to use a CPR mask to make this much safer. A first aid kit may include a CPR mask or barrier device. People can learn about first aid from books ("manuals") and videos. 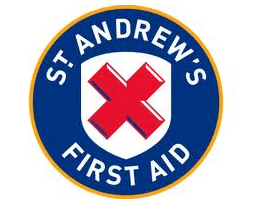 A good first aid kit will often include a simple First Aid Guide. It is best to have good training to give first aid. In addition to books and videos, good training includes a good teacher and the chance to practice. For example, CPR is practiced on a dummy called a manikin, so a student can learn to push down on someone's chest in an emergency without actually doing it to a person. The teacher makes sure the first aid student is doing the skill correctly. Training can be given by an organization or by a professional medical person, like a doctor, a nurse, or a paramedic. Organizations that teach first aid include the International Red Cross, schools, hospitals, the military, Scout groups, and rescue groups such as fire departments. The level of training needed to be a first aid helper changes from country to country. For example, in the United Kingdom and the United States, you can go on a 1-day course to become a first aid giver. In the U.K., you can go on a 4-day course for emergencies in a place of work. All firefighters, police officers, and soldiers are trained in first aid during their basic training. 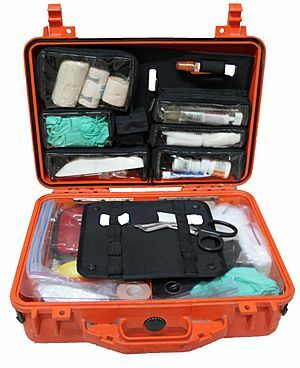 A waterproof Pelican first aid kit. First aid Facts for Kids. Kiddle Encyclopedia.